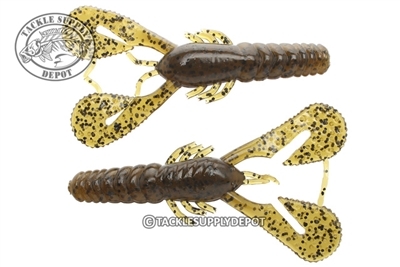 Adaptive, versatile fishermen will find the Turbo CrawZ to be the ultimate swim jig or ChatterBait trailer, as well as a deadly soft plastic companion whether Texas rigging, Carolina rigging, flipping, or buzzing the top. Incredibly durable and lifelike, the bait's specially designed Turbo ClawZ thump at even the slightest rod movement or reel crank. As important, Z-Man's super buoyant ElaZtech material allows the ClawZ to rise up off the bottom in a natural defensive posture. DISCLAIMER Do Not mix ElaZtech baits with standard plastic baits. You can either put these on a plain ned rig or on a skirted jig. They are super elastic and very durable. Good body dimensions.